Photo DVD Maker helps you create photo album on DVD disc playable on TV, website, mobile devices such as Apple iPod, Sony PSP (PSP Phat/PSP Slim/PSP Vita), cellular phone. With few clicks, Photo DVD Maker creates a professional-looking photo slide show with background music, Pan&Zoom and transition effects. It supports DVD, SVCD and VCD 2.0, MPEG, MPEG-4, Flash Video (*. 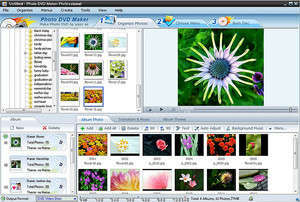 Photo DVD Maker Professional 7.36 is a shareware program and can be used as a demo to try the software until the free trial period has ended. A full version of the program is available after the trial period ends. For security reasons, you should also check out the Photo DVD Maker Professional download at LO4D.com which includes virus and malware tests. Additional screenshots of this application download may be available, too. Create professional slideshows and albums with these free downloads offered by the editing staff who also post reviews and updates to software on a constant basis. Check out some of the freeware downloads available in the slideshow creator category. They contain no strings and are available at zero cost.